The temperatures have been steadily rising here on the surface, but what about below ground? 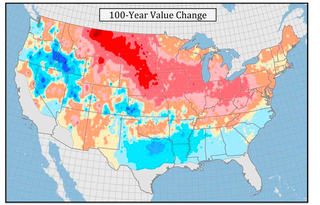 Temperatures are going up there as well, as you can see in this map of changes over the last several decades in ground conditions. And it has something troubling to tell us about our water. So what does this all have to do with water, or, specifically, the lack of it? Well, when the ground freezes less deeply, the soil becomes drier. When that happens over and over again, you not only have less fertile soil, you may also start to go deeper into groundwater reserves. And — as we've seen in California, not to mention elsewhere — we're already hitting those hard.